Some have pointed to the fact that, in classic western culture (both Greek and Roman), May was recognized as the season of the beginning of new life. In the Greek world, May was dedicated to the goddess Artemis and associated with fecundity. Roman culture linked the month of May to Flora, the goddess of bloom and blossoms – this led to the custom of ludi florales (or floral games) which took place at the very end of April as a preparation for entering into the month of May. 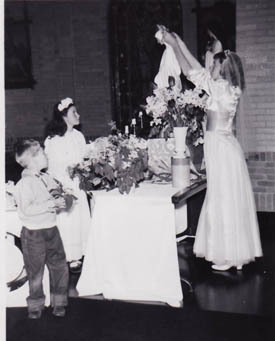 It seems that this ancient tradition of connecting May with new life and fecundity, led to a realization that May is very much the month of motherhood – this may be the reason why Mother’s Day is celebrated during May not only in the United States but in many countries and cultures of both the East and the West. In the month of May, the winter comes to an end and the spring season begins (this was the official beginning of spring in Roman culture). This new beginning and new birth is a testimony to the motherhood of Mother Earth. The poem was written at Stonyhurst in May, 1878. Fr. Hopkins was 33 at the time, and eight months a priest. Do you have any explanation for the association of Saturdays with Our Lady? Blessed John Henry Newman, C.O. isn't May Our Lady's month because it then is Springtime in the northern hemisphere? and Our Lady is the Queen of roses,happiness and our hearts, all blossoming with love for gentle Jesus her Son.